In the past six scheduled organizing days (scheduled over two weeks), we worked on organizing just twice – on the 23rd and the 26th day. We rested from this project on the other four days, as it has sapped our strength (physically, mentally, and emotionally). On the 23rd day I shared my overwhelm and fatigue with the professional organizer helping me, Hillary. During the three-hour session, I shared the pains-of-it-all (When will I have my life back?!!!!!!!!!!!) and devised doable next-steps with her for an hour and a half. Now the other helper helping me, Edith, would ask… why am I holding on to this stuff – why do I allow it to imprison me the way it is doing now? The reality is that I have little control over these estate boxes that I’ve inherited. I have only so much energy each week to open, sort, and decide on stuff. The stuff of my family home is a lot of life moments filling my senses as I touch it, remember it, and then feel a paralyzation around what next to do with it. This is how I felt when on the 23rd day we used the last half of the session to open a few blanket, pillow, and sheet boxes. We stacked the linens on a twin bed and suddenly this category that was supposed to be easy-to-decide was not. It left me with a feeling of dread. Just how much longer is this project going to take me when I can’t get through the stuff I’ve qualified as easy? My head felt heavy-like-a-padded-room for five days. I caught a virus from my beloved life-partner and lost my lunch and dinner in a soup pot on day 24. I took a sick day on day 25. On day 26, today, Hillary came and helped clean out the front coat closet, which had become a catch-basin for a heavy wheelchair, several walkers, safety handrails, holiday decorations, family scrapbooks, vacuum parts, and coats. 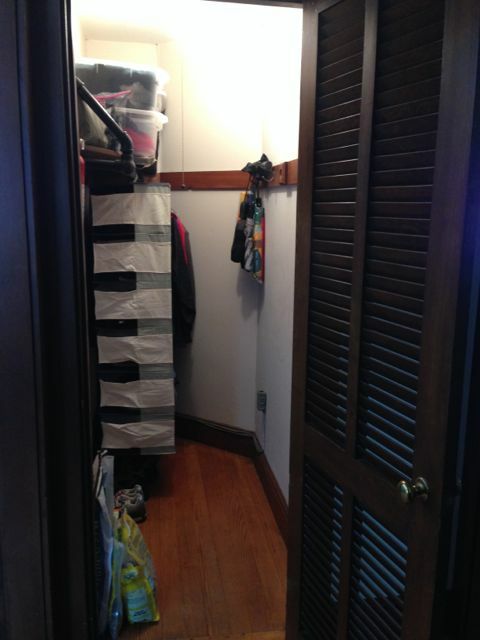 Much of the stuff was removed from the closet and brought to other areas of the home where similar stuff is stored. This allowed us to sweep the floor and shelf inside the closet, and integrate items from my family home that were previously thoughtfully sorted and organized, like hats, mittens, gloves, scarves, and winter boots. I’m sure if you have read this far, you understand why I am so very tired and grateful to escape this project for the next ten days. I will fly away, sit in the sun, rest, restore, and hopefully come back with spring in my step, heart, and mind.